Crispy Sweet Potato Fries that are perfectly crispy and still fluffy in the middle with both fried and oven baked directions with a single magic ingredient to keep them crispy! If you love Sweet Potato Fries you’ll have to check out these Fried Cheese Curds, Beer Battered Onion Rings and Loaded Garlic French Fries too for all the best fried comfort foods for your summer bbq and grilling recipes! Crispy Sweet Potato Fries! Yes, we are in full swing of fun summer recipes and today is no exception. 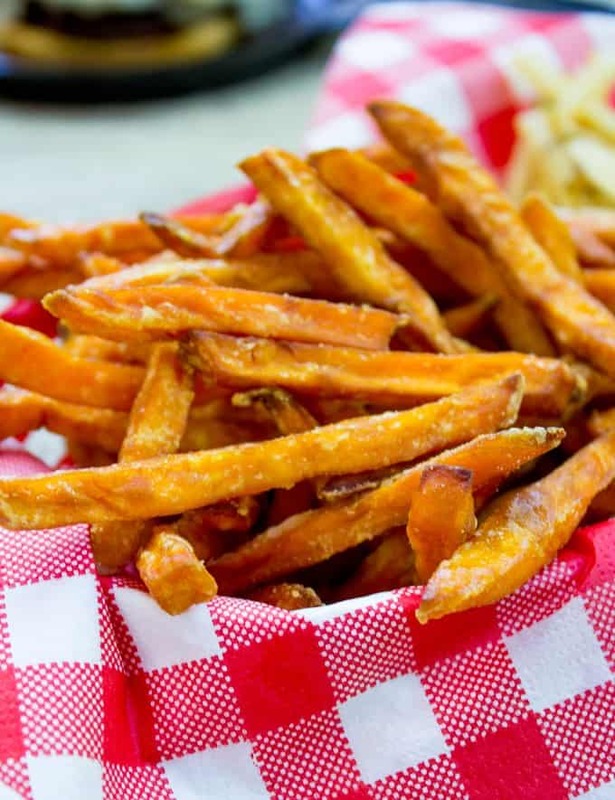 These homemade sweet potato fries were one of the biggest hits at a recent Memorial Day BBQ party for 40 people (yes, Crispy Sweet Potato Fries for 40!) 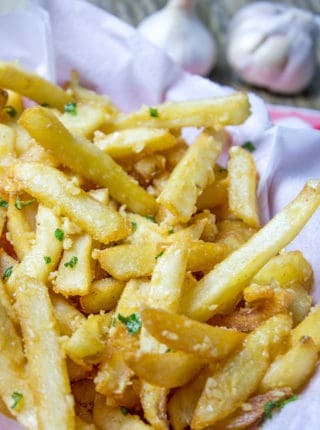 and it is all thanks to one secret ingredient that makes these crispy fries! I’m not sure if you’re like me, but I love sweet potato fries. I was introduced to them sort of late, being a purist and all. I couldn’t understand why anyone would mess with the perfect food, French Fries, long enough to make them out of a different potato. 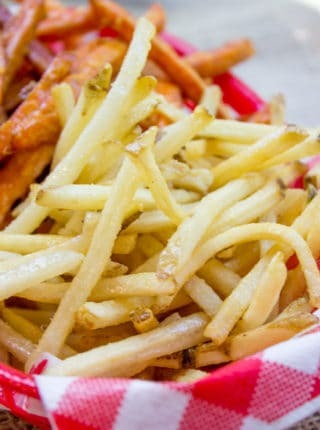 Then, one day I was at a burger place back in LA that offered 1/2 fries, 1/2 sweet potato fries. YES! All the adventure, 50% the commitment. If you’ve ever wondered how to make sweet potato fries crisp up and not look like noodles 2 minutes after they come out of the fryer? Look no further. Crispy Sweet Potato Fries are COMPLETELY doable, and they’re easy in fact! Yes, they still need a second fry, but they don’t need a long soak! And I don’t even boil them ahead like I do with normal fries. Here’s the secret…. cornstarch! If you don’t want to fry these sweet potatoes you can absolutely make crispy baked sweet potato fries too! Oven baked Sweet Potato Fries are SO EASY and also use the same cornstarch trick the fried version use (just use much less cornstarch). You can also use parchment paper if you’re baking these fries because the sweet potatoes can stick if you use the cornstarch, or if you use less oil than you should. Also be sure you give them enough time to really crisp up, if you turn them too early they may still stick to the pan. Cut the 1 pound sweet potatoes into matchsticks about 1/4″ thick and toss with vegetable oil or olive oil, 2 tablespoons cornstarch, 1 teaspoon kosher salt and 1/2 teaspoon black pepper. Spread in a single layer on a baking sheet and bake for 15 minutes, flip over and cook for 15 additional minutes. 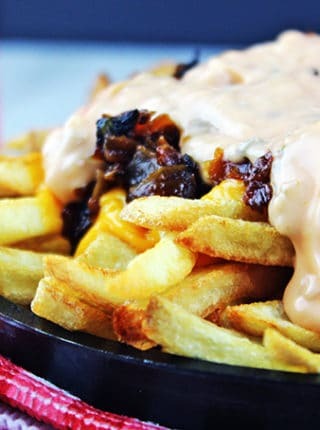 If you want to add more seasonings to your fries you can certainly add more spices. 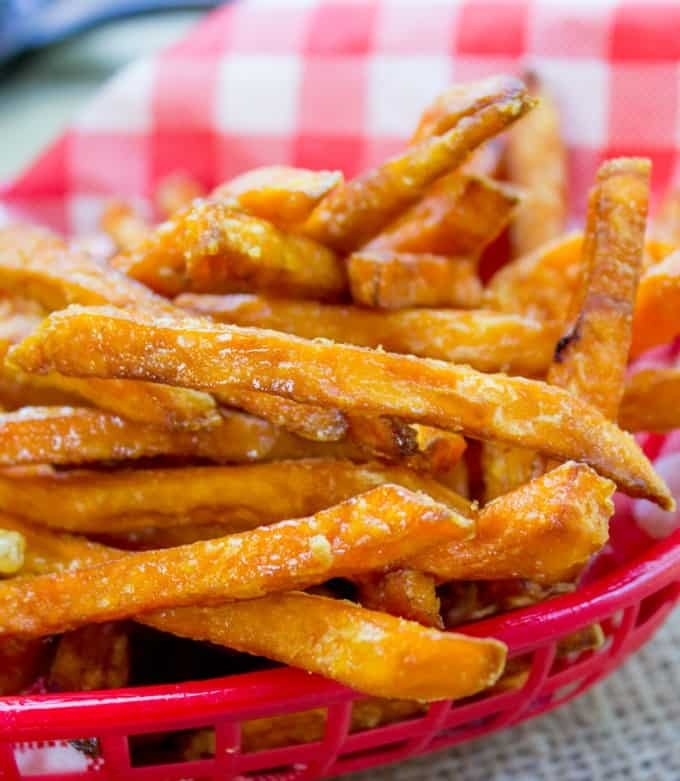 Sweet Potato Fries scream summer favorites including Fried Chicken, Pulled Pork, BBQ Pulled Chicken, Slow Cooker Ribs and all the best summer side dishes including Macaroni Salad, Coleslaw and Pasta Salad. Sweet Potato fries are the perfect fried comfort food. Mix all the ingredients together and refrigerate for at least an hour. Cast Iron Dutch Oven – For Frying, keeps even heat well and not expensive! Oil Thermometer – NEVER guess your temps, you’ll end up with greasy or burned fries. Spider Strainer – My go to for frying, removes/drains almost whole batch at once. French Fry Basket – Because they are adorable for serving! Checkered Liners – Catches grease, disposable and cheap. Crispy Sweet Potato Fries with a single magic ingredient to keep them crispy! No more soggy fries, these stay crispy even if you have to reheat in the oven. Wash and peel your sweet potatoes. Cut into 1/4 inch thick fries and rinse the potatoes for about 10-15 seconds under cold water then dry with paper towels or a clean dish cloth you don't mind turning slightly orange. Mix the cornstarch with the water to make a slurry in a large bowl or large ziploc bag, add sweet potatoes and toss to coat. Heat your oil in your pot to 350 degrees and add the fries 1 at a time so they don't stick together, but make sure you don't overcrowd your pan. Each time you do another round of potatoes toss the potatoes in the slurry again to prevent the cornstarch from settling. This should only take a few seconds and is even easier if you have a ziploc bag you can just flip upside down a few times and shake. Fry for 1-2 minutes (no browning yet) and drain on a brown paper bag. 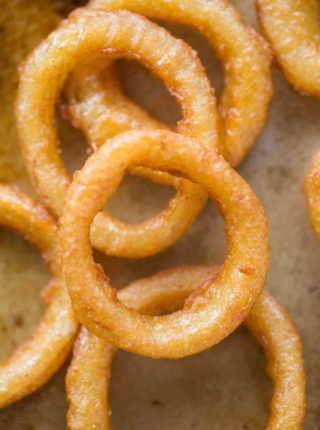 Once all the fries are done with their first dip in the oil, start the second round of frying, then fry them the second time for an additional 2 minutes, until they're browned and crispy. To reheat: If you're making ahead for a crowd, you can heat them in the oven at 325 degrees for 5-7 minutes to crisp them back up. Haha, you gotta try them! I made the sweet potato fries. Delicious is all I can say? Thanks so much for the 5 stars, Gennett! So glad you enjoyed them! Question: on the 3bd fry do I put fries in the cornstarch slurry a 2nd time prior to frying a 2nd time? You don’t put them through the slurry again, just fry them. Hope this helps! Enjoy! Seems easy…I hope I get it right. Looking forward to more easy recipes. If no corn starch. Can they be fried anyway. Just salt and pepper and garlic and paprika. You can but they just won’t be crispy. If you leave them in the oil enough to get crispy then the inside won’t be fluffy and soft. I didn’t see baking soda in the ingredients list, did I miss something? So sorry, I think we both meant cornstarch. Thanks for catching that! was the baking soda sort of old and compacted? Or did it get caked on a bit too much? Thank you for coming back to let me know how much you enjoyed it! Do you think these can be frozen? If so, would i freeze it after the first dip in the fryer? Thanks for the recipe. Sorry this comment took so long to get to, it ended up in my spam filter somehow! If you freeze definitely do it after the first fry to avoid spoilage of the fry. It may need a slightly hotter oil to compensate for the much more severe drop in temperature too. Wow – fries that stay crispy? So cool! Hahaha I was the same way! I got my sweet potato start several years back…such adventurous eaters we are 🙂 And I love the corn starch method!!! These look perfect! I’ve only tried making sweet potato fries twice and haven’t been able to get them crispy. I’ll need to try it with the cornstarch next time, thanks! I’ve been wanting to try sweet potato fries like this *forever* 😀 Looking forward to making them! 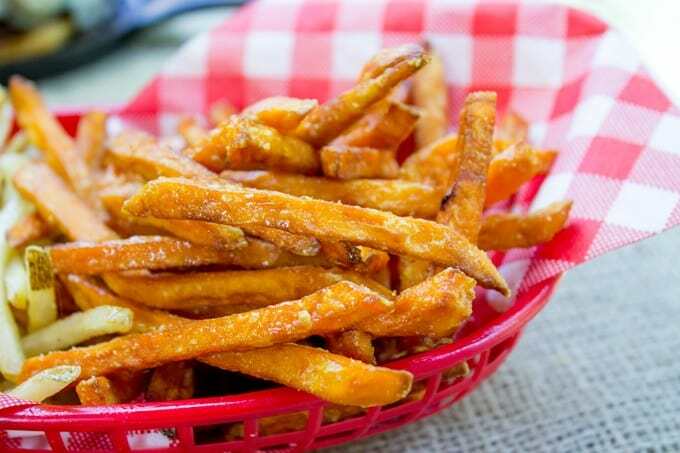 Sweet potato fries are my favorite…especially when they’re crispy. Thanks for the cornstarch tip! I, also, love Lucille’s BBQ. 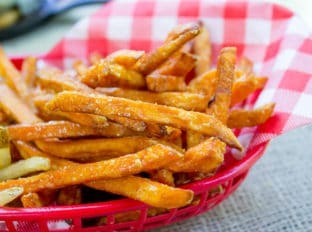 I love sweet potato fries too, anytime I can order them I do. I am going to have to try out the cornstarch trick.